One of the sections I tend to read in online news are local/state job reports, since they tend to be a bellwether for economic growth, and by extension new development projects that get featured in this blog. One of the things that has been of some curiosity to me in the past couple months is how poorly Ithaca’s economy appear to be doing. According to the NYS Labor Department, the state has seen about 2% in private sector jobs over the past 12 months – about 134,000. Not great, but not bad for a state that has been bogged down in economic doldrums since Gerald Ford was in office. As one would expect, some metros do better (Kingston, Utica-Rome) and two show remarkable decreases of -3.6% and -5.6%. These would be Elmira and Ithaca respectively. Now, perhaps its just me, but if the economic shrank 6%in one year in a county of Tompkin’s size, you’d hear about it (and no, I don’t think there’s some vast political conspiracy by some partisan group to hide the figures). 3,200 jobs lost is something that can’t seem to occur unless there was very large company closing, something that would’ve been alluded to in the Ithaca Journal. As far as I know, Borg-Warner is still operating, and Cornell laid off at most a small fraction of 3,200 in the past year. There haven’t been huge decreases in sales of “essential” goods, not has help wanted advertising changed dramatically (assuming the monthly reports of Elias Kacapyr are correct, anyway). So for the longest time, I had been wondering what the heck was going on in Tompkins County. Well, it would seem that I wasn’t the only one wondering about this. The local county development agency accuses the Board of Labor Statistics of undercounting jobs, a problem they state has been an issue in the recent past. As much as the cynic within me is tempted to see as someone just trying to downplay the number, I’m inclined to believe that they’re right, because the rest of the numbers don’t show the drastic changes such a sharp drop would entail. One would expect a large drop in help wanted advertising, a reduction in building permits, and a decrease in sales, especially luxury goods. While these all have had ups and downs, none of these have changed to a degree that would support such a steep job loss. So, it doesn’t pass the logic test (unless one argues there much more commuting to the 4,400 jobs added in Binghamton and Syracuse). Of course, any job loss is a bad thing. But I wonder where in the world the Bureau of Labor Statistics is getting these numbers. My oh my. This blog turns four years ago today. I wanted to celebrate this port by comparing this blog to the average age of blogs, or the average number of posts for an active blog. Turns out neither piece of data is readily available. I’m going to go out on a limb and assume this blog has reached maturity, though I won’t go as far to say “old age”. In keeping in tune with three previous three “birthday” updates, here’s some fun facts. The highest month was once again March, with 8,247 hits, although the peak isn’t as pronounced as it was in previous years. Going year-to-year, the only month that was lower in 2011/12 versus 2010/11 was August, although June and July came fairly close. This is due to the Cornell-centric nature of the blog – once classes are out for the summer break, my hit tally plummets like a stone. Although, that’s been somewhat avoided this year, which I’ll guess is the result of the more Ithaca-area focus taken on in the past year, and is a bit more stable in terms of visitors to this site. ~In planning and development,the biggest news is the construction of Collegetown Terrace the massive 1200-bed project south of Collegetown. Approvals were granted and phase one is underway, with an August opening for the first buildings. The Vine Street Cottages also began construction, replacement apartments were planned for 107 Cook, and 309 Eddy marched merrily towards completion, which should be in just a few short months.The Coal Yard apartments phase II was built, and Collegetown Crossing was proposed with the radical premise of no parking for residents, in a move that could make or break Collegetown. in suburbia, everyone got BJ’s in Lansing, and the holiest of holy casual dining restaurants came to big box land, a Chipotle. Closer downtown, the Seneca Way project was approved and is now in site prep, and the new Fairfield Inn is under construction down in chain store country. 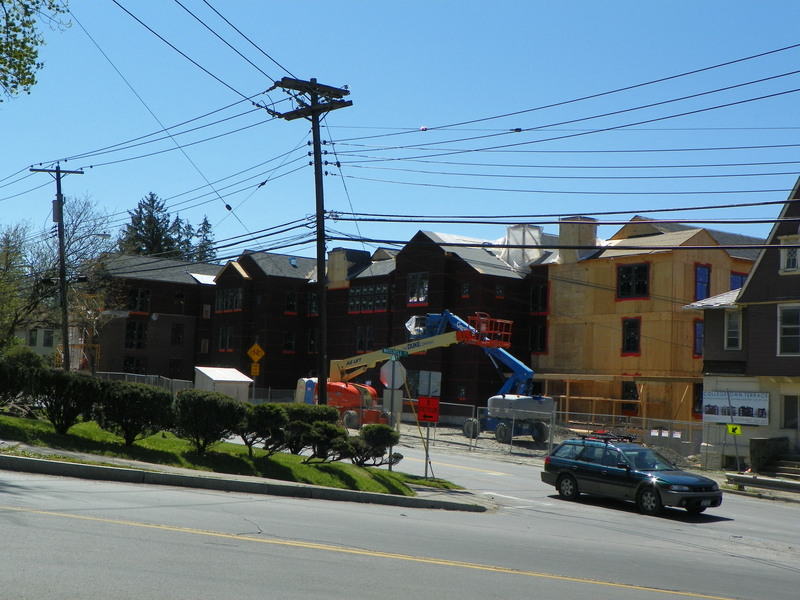 The Argos Inn renovation moved towards completion and the Breckinridge Place project began construction, currently in the demo phase of the old Women’s Community building. Several smaller projects also began construction, such as the Iacovelli apartments on West Seneca and the Magnolia House women’s shelter. 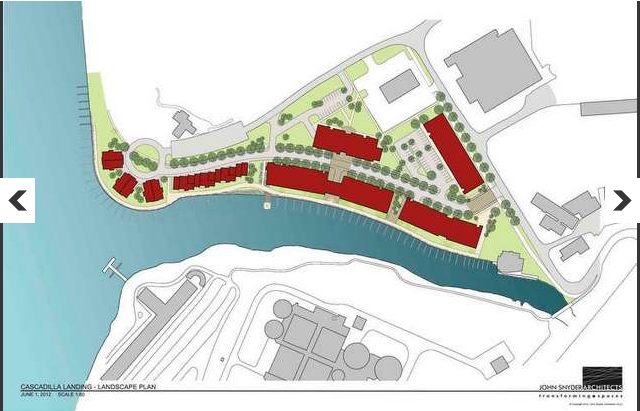 In the longer-term, the massive Cascadilla Landing project was proposed, and could potentially redefine the city waterfront, and the new Holiday Inn tower/renovation will add a small conference center to the Gorge City. 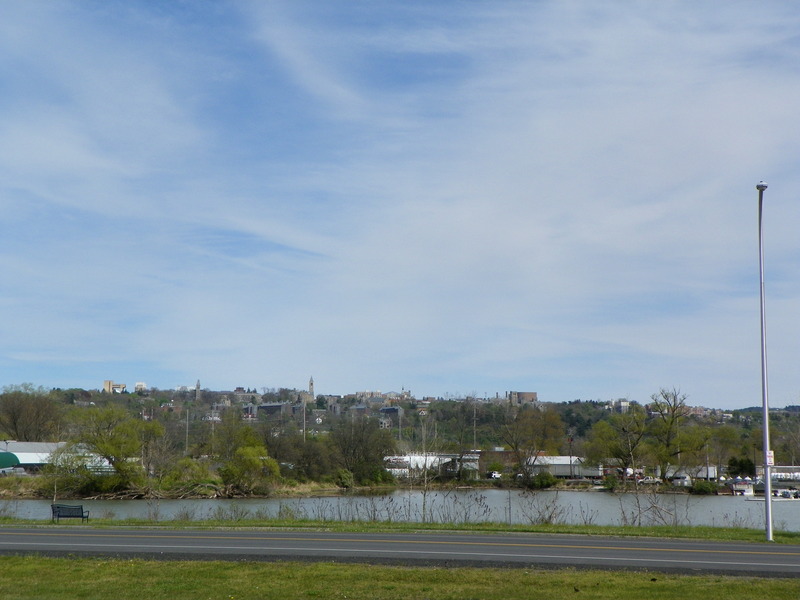 Over at the colleges, Ithaca College built a boathouse and started its Circle Apartments expansion. Over on East Hill, Milstein Hall, MVR north, and the Johnson addition were completed, the food science building is well underway, Gates Hall is in foundation work, and the law school just launched their underground addition. The Big Red bandhouse is set to start shortly, and Kappa Delta renovated their home-away-from-home in what was probably the most significant Greek house renovation in more than a decade. Fundraising began for the new token glass box, also known as the Goldwin Smith Hall addition. More importantly, some bridge nets and barriers were approved, and their construction will hopefully bring to an end a dark chapter of Cornell’s history. In the meanwhile, some projects still have yet to get off the ground. 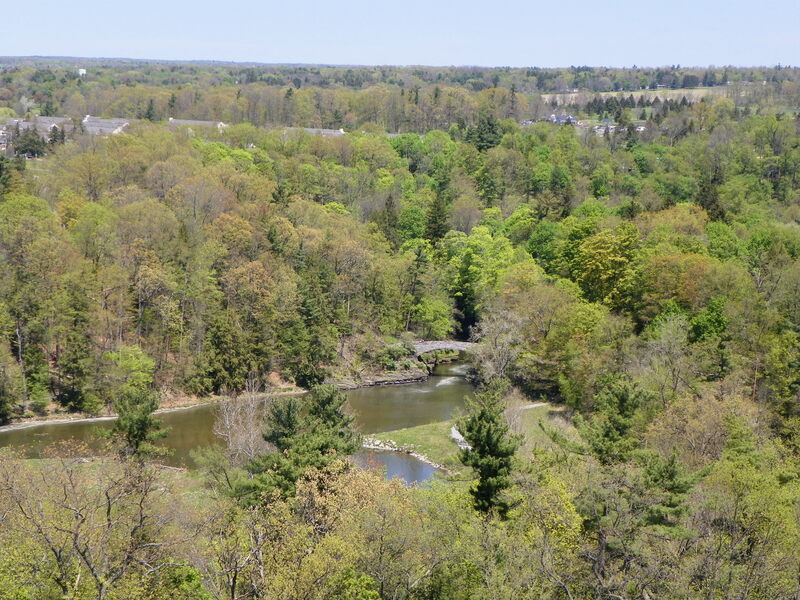 The Hotel Ithaca is still in some financing conundrum, as are the Cayuga Green Condos, which were given an extension on their cost-saving agreement with the city, given the poor lending climate. Ithaca Gun is undergoing yet more land remediation with no construction date in sight (honestly, it seems like the only way the land could have been more contaminated is if someone nuked it). ~Turning an eye towards Cornell matters, the least surprising lawsuit was launched when the mother of George Desdunes filed a wrongful death suit against SAE to the tune of $25 million. The bench trial wrapped up about a month ago, though I’ve yet to hear about a verdict. The number of bars near Cornell continued to shrink, but students can now drown their sorrows in frozen yogurt instead. When the Palms said they were closing up, a couple dozen of my fraternity’s young alumni offered to buy a table of some sentimental value to us if they were willing part with it. They asked for $1500 for a rotting wooden bench table. We laughed (we were thinking $500 max). They said they were serious and it was a starting bid. Needless to say, I have many happy memories of a table that hopefully no longer exists. Rumor has it a new apartment tower will rise where the Palms once drunkified multitudes of Cornellians. ~From a meteorological standpoint, the ITH toyed with 100-degree temps and had a collective anxiety attack about the impending arrival of Hurricane Irene, but was spared the brunt of the destructive tropical cyclone. However, this relief was short lived when the extratropical remnants of Tropical Storm Lee dumped 8.7″ in 24 hours at Binghamton, and flooded many local towns to the tune of $1 billion in damage, a number not seen since the horrific aftermath of Hurricane Agnes in 1972. It also resulted in one of the wettest years on record. Ithaca, while soaked and unnerved, was relatively unscathed. Many things, many topics. In comparison to the past years, I now write this while firmly ensconced in alumnidom, my trips back further and further apart. At this point, I’m finishing grad school, and interviewing for positions in California and Texas. It was not exactly in my wishes to move as far out, as my northeastern blood may not be able to tolerate nice winters. But, that’s where the jobs are in my field at the moment. Ideally, I can make a triumphant return to the northeast someday. I write not out of obligation, but out of genuine interest, which I think has been one of the attributes that has made this blog a reasonable success. 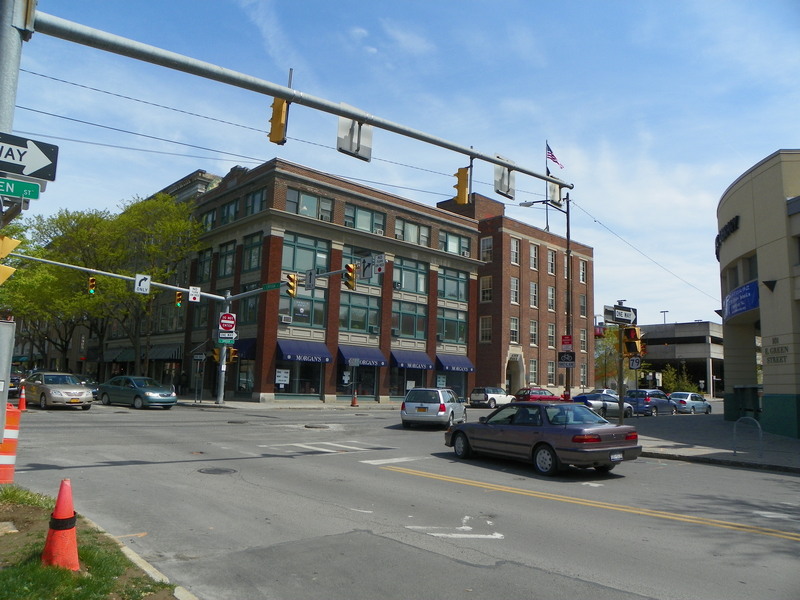 I see the emails of those who follow comments and posts – they include other alumni and current students of course, but also prominent companies in Ithaca and some local government officials. Flattering, if a little disquieting for fear of botching up my facts. More importantly, I think it serves as an indicator of the usefulness of this blog, that people honestly come here searching out information, and many of them leave feeling a bit knowledgeable about Ithaca projects and stories, or Cornell history and construction projects. Or at least, I hope as much. It makes for great motivation in the months and years ahead. For those who pay any attention to Ithaca’s physical plant, news has been floated around for a while of a proposed waterfront project next to the city golf course, which in reference, was referred to as the “Johnson Boatyard Development”, after the boatyard located on the current property. 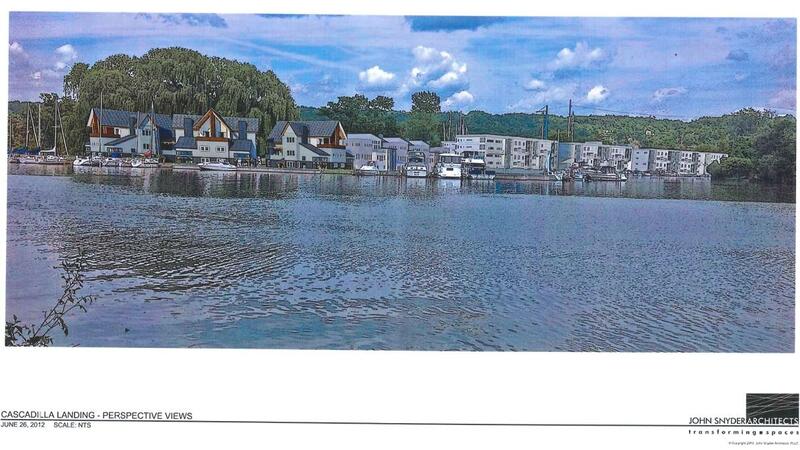 Well, in the fee-to-see Ithaca Journal this morning, renderings were shown for the proposed “Cascadilla Landing” project, which is the official name of the development. More renderings are included within a PDF from John Snyder Architects hosted on the IJ website. I would love to share some of the images, but now that content is pay-to-play, that puts me in a much more difficult position. It was one thing to share an image up from a free online paper. But now that content is not free, the legal waters have become a bit dicier. I will say this much: click the links, visitors have a limited number of article hits before content is no longer displayed. After that, there are several other ways to get around the content wall (or you can pay). If I see them hosted (i.e. not linked) on a “free” content website, I’ll include them here. But until then…yeah. It’s unfortunate. 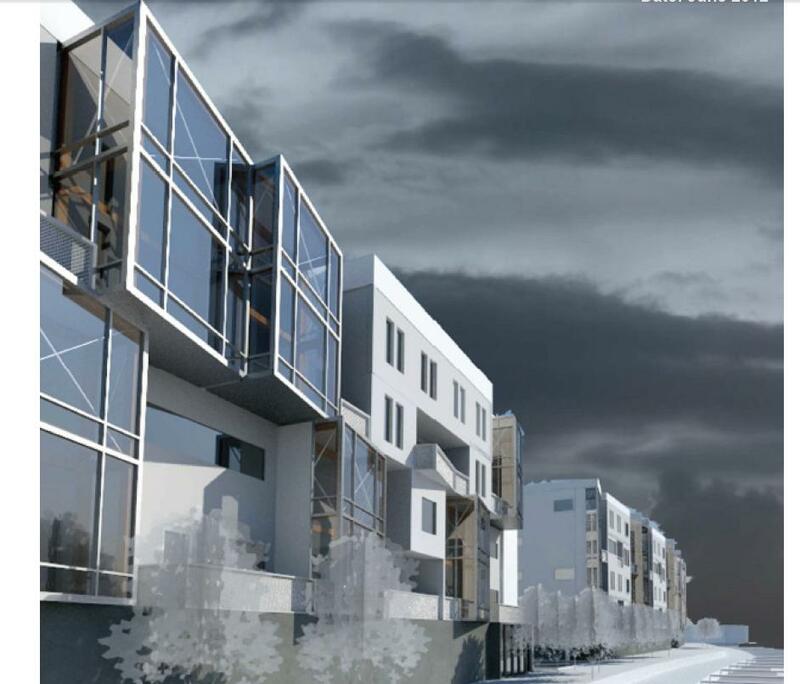 Following the PDF, the project has 185 units – 6 in duplexs, 11 townhomes, 168 apartments. The mid-rise apartment buildings are furthest east, with the townhomes in the middle, and three three-story duplex buildings built around the traffic circle that completes the west end of the project. Phase 1 has two buildings of 82 and 44 units respectively, in three 5-story apartment buildings, two of which are connected by a skybridge. Construction would start on Phase I in Spring 2013. The main street appears to double as an internal promenade. As for the design, John Snyder Architects opted for angular and ultramodern. The duplexs have gable roofs and wood trim, and bear superficial similarities to the buildings going up at the 900 block portion of Collegetown Terrace. The apartment buildings are an angular pastiche of windows of all shapes and sizes and random balconies and overhangs closer to the waterfront, and a bit more orderly further into the property. The colors as shown are rather muted whites and greys. No one will ever call it pretty, but it certainly stands out from the traditional built environment. 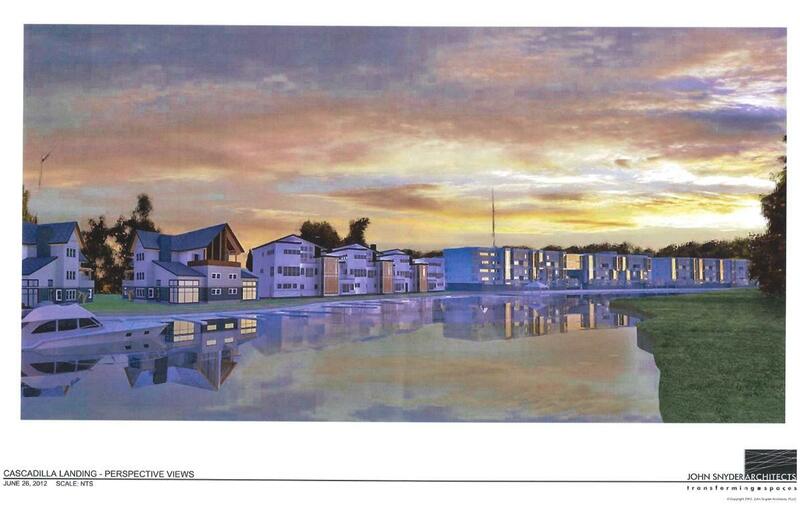 The townhome designs are not really shown, they’re likely still in the initial design process. 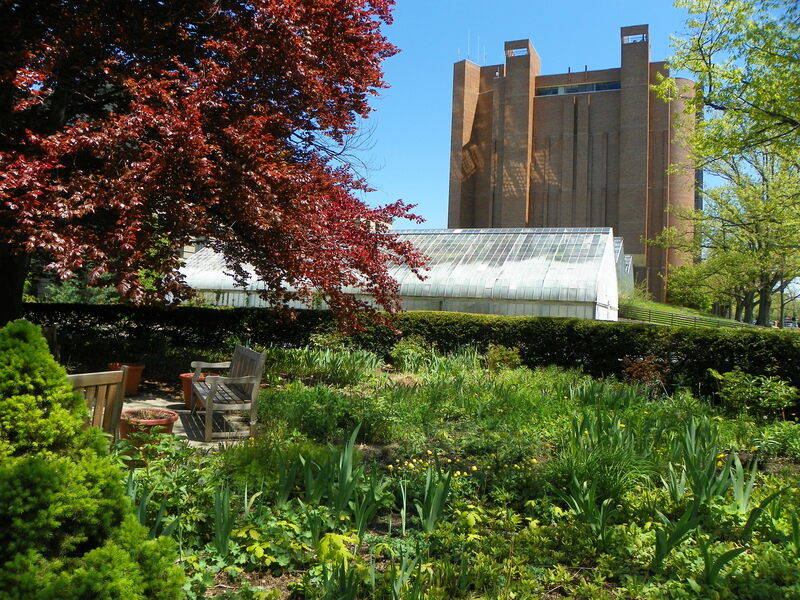 Ithaca’s economy hasn’t been something to be too excited about lately, but this project shows there must still be some demand to live in the City of Gorges. Distinguishing between the years of students of Cornell can be rather difficult after about the first month of the academic year. Unless it’s orientation, Greek rush, or some other telling factor, you can take a glance at some random person crossing the quad and have no idea whether or not they’re a freshman, a junior, or perhaps even a young grad student (whereas for older grad students, they might be mistaken for professors). However, it’s not like anyone worries about that; except in the case of love and relationships (senior to senior: you’re dating a freshman? Robbing the cradle much? ), someone’s year usually doesn’t merit much attention. Well, things were a bit different back in the day. In the days of yore, it was traditional for freshman males at Cornell (known as “pikers”, like those referenced in “Give My Regards to Davy”) to wear a rather peculiar-looking felt cap called a “Beanie”, which was like a snow hat (wikipedia directs the query to “tuque”, a word I’ve never used in my life), red in color with a grey button on the top. 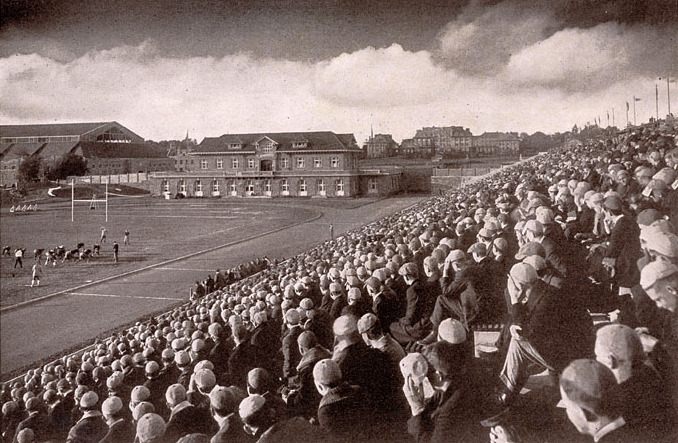 Examples can be seen in the below photo, which dates from a 1919 Cornell football game. The Beanie was part of the mandatory rules for freshmen, and they were required to wear it in public until the spring, when all the freshmen burned their caps in a ceremonial bonfire. This was a kinda cutesy little sentimental event meant to instill class camaraderie and make warm fuzzies, when the sophomores weren’t trying to kick the crap out of freshmen in the occasional class battles. The cap rule, along with other rules such as not walking on the grass and not wearing any high school or prep school emblems, tended to be strictly enforced, and with harsh consequences. Violators were liable to have their heads shaved or go for a quick dunk into Beebe Lake. Of special note regarding the beanies is the case of Frederick Morelli, a freshman originally of the class of 1924, who absolutely refused to wear his beanie. After numerous dunkings and warnings from his peers (including a double dunking into a public fountain and the lake, with a placard hung on his neck saying “Moral: wear a frosh cap”), Morelli ended up being pursued by a mob of angry upperclassmen, and had to be saved by the president of the university to avoid serious injury. The Sun actually condoned the mob’s behavior. But George Lincoln Burr, the most senior faculty member at the university at the time, threatened resignation over the manifestation of “lynch law” on the campus. Fred Morelli withdrew from the university, but returned a couple years later and graduated in the class of 1926. Perhaps his penchant of pushing his bounds played into his undoing; after graduation, he became a gangster and nightclub owner, and was gunned down outside of his club in Utica in 1947. Fun fact: the city of Utica was run by the Mafia and its associates for decades, up through the early 1990s. The caps faded out, as did the class battles, as a result of the changing demographics post-WWII. Frankly, after killing men in trenches, and now married with children, most vets who came in under the G.I. Bill as freshmen could not give two salts for collegiate antics. When the sophomores made an attempt to enforce the rules in 1949 by shaving the heads of three frosh, the enraged students brought their grievances before the mostly G.I.-composed Student Council, who promptly banned enforcement of the practice. The beanie remained voluntary up to the early 1960s, when it faded out completely. So nowadays, students can feel completely to engage with members of the other classes. Unless it involves doing a walk of shame to Collegetown from a freshman dorm. That would be awkward. The location is a parcel next to the Rabco (Highland House) Apartments on the corner of Highland Road and Thurston Avenue. To give you a better sense of locale, its the woody, slightly hilly piece of land across Thurston from Seal & Serpent, and across Highland from Alpha Zeta. A highly trafficked area, the property was once home to the Wyckoff Mansion, which became the home of Phi Kappa Psi from 1915-1964. The Wyckoff property was torn down to make way for the Rabco Apartments, which were finished in 1966. This portion of the parcel has never been developed. I actually used to walk by here almost every day, but never felt the urge to get photos of a stand of trees and rocks. 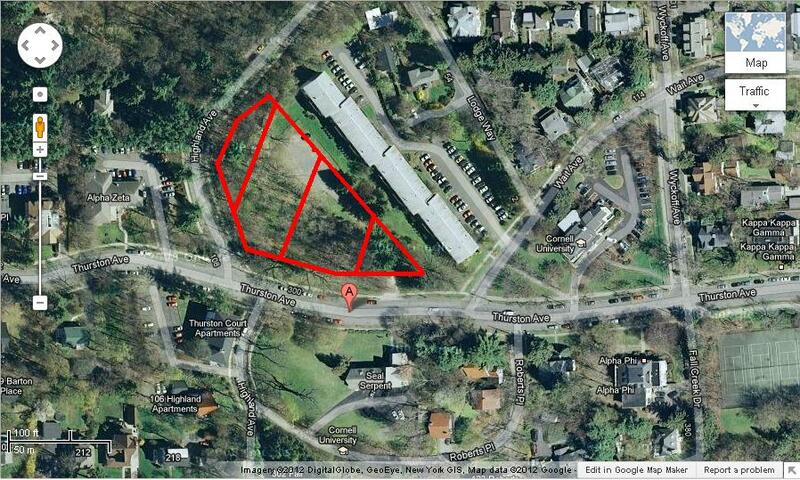 The proposal is as follows: three buildings, clustered, four stories in height (est. height ~40 feet, within zoning regulation). 36 units and 88 beds, making it one of the densest properties north of campus. 40 parking spaces are proposed, but the planning board has expressed the desire to share space with the excess western parking lot on the Rabco property, and that will probably be a stipulation for approval. Time-wise, since this is the sketch plan, and given the size and location, don’t expect construction for several months (although they want city approval by late July – which is highly unlikely), and expect a year more before it is complete. The project lies within a contextually-sensitive area, the Cornell Heights Historic District, and its design will probably be much more scrutinized as a result. It may also be rather historicist, because I can’t anyone is going to approve a “modernist” or “contemporary” design in the heart of a historic district, even in a city that likes svelte modern boxes. On another piece of news, the Johnson Boatyard project has realigned its entrance to be on Willow Avenue rather than Pier Road (not a big changed, it just means its moved from the north end to the east end of the property), and the number of duplexes has been decreased from eleven to six. The project still has townhomes [warning: Ithaca Journal link], which now vary from 1-2 stories in height. A small retail portion might be included in the first phase. After all the news about the original proposal, this first phase is a bit…underwhelming.